Dan Schawbel is the kid who took personal branding and Gen Y by storm not too long ago. He came into the blogging space with an ability to comment on just about every career blog in a way that made me tired just watching! How Can We Use Technology to Recruit Others? I haven’t read my copy yet but these are some pretty big names in the career space… I would say that I’m impressed but this is on par for what Dan Schawbel puts together. 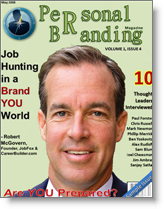 If the sample isn’t enough for you, you can get the full version (issue 4 is released on May 1) at the Personal Branding Magazine homepage, and subscribe to one year of personal branding magazines (4 issues) for just $12.95.